About 2.5 years ago, my husband accidentally broke my $40 plastic ball winder. It had some flaws, the all plastic construction being one of them (there was no way to fix the broken one without causing it to stop turning, which would have rendered it decorative rather than functional). Instead, I decided to upgrade to a Strauch Jumbo Ball Winder because they’re handmade from wood and metal and the price was reasonable for the materials and craftsmanship. Also, it winds up to one pound balls!! So I ordered it, and anxiously anticipated the balls I would wind. I packed it and took it to UPS on the evening of January 11th. It arrived in Virginia on January 18th and was repaired and shipped back to me on the 19th. Yes, they fixed it the same day it arrived with them. It arrived back with me yesterday and I am so pleased to report that it works perfectly. I wound a ball and it was a. super fast and b. super easy. No frustrating slippage. I’m so pleased that I chose to spend my money with them, because it’s been an investment well worth making. And now, I need to find a 1 pound skein to wind. Giant yarn balls, here I come! That is AWESOME customer service. It’s so nice when you get that. I had a little run-in myself with good service and it’s enough to make you stick with that brand for life, isn’t it? That is great I love that companies like that still exist. On a side note I LOVE LOVE the phrase “yarn barfy mess” I have have to steal it for something. 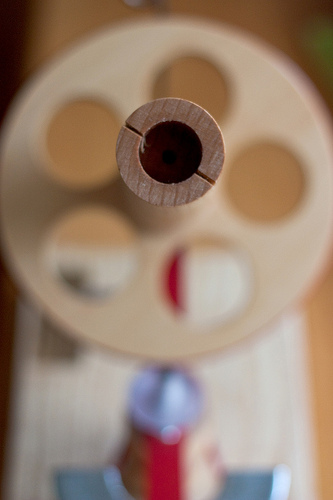 I have the Strauch ball winder too, and mine is also misbehaving, just like yours–a yarn barfy mess! Maybe I should contact Strauch? Definitely contact them! They told me that they never want to have an unhappy customer, ever.